That tricky second album. How to follow up on the success of your debut with something both familiar and different? The 14-piece brass and percussion combo Superbrass has found a way. The first album, Under the Spell of Spain, was a mixed programme with a Spanish flavour. For Brass Taps the group has taken water as its theme, performing 11 new works and arrangements, all tailored to their laid-back but highly virtuosic style. In fact, the water theme is pretty tenuous, much more so than the Spanish connection the last time round. But it doesn’t matter a bit, because all the tracks here share common stylistic traits. Most are in a jazzy swing/big band idiom, all are easy on the ear, and at every stage the overriding impression is of highly skilled performers, maintaining world-class standards, but also letting their hair down and having fun with the music. Superbrass is evidently a very democratic, or at least communal, operation. The soloists don’t get credited on the individual tracks, nor, more surprisingly, do the composers and arrangers. Even the conductor, Douglas Mitchell, only gets a small-type listing, no more prominent than those of the players, in the back of the liner. The liner itself has an imaginative nautical theme, and in the performer listing, bass trombonist Roger Argente makes the grade of Captain. That’s fair, as the whole Superbrass project is his baby. But having done all the organisation and gotten everyone together, he’s happy to take his seat at the bottom of the trombone section. Not that he shrinks from the limelight even there; the bass trombone playing is spectacular – just listen to the big fat low brass riff at the start of Wade in the Water or the beautifully focussed pedal on the last note of Underground Plumbing Blues. In fact, everyone shines. The players come from a mixture of orchestral and jazz backgrounds, and the net result is a style that is predominantly straight orchestral brass playing, but with just a hint of jazzy flair. The instruments are orchestral, apart from occasional colouring from flugel and euphonium, including a nice euph solo on Underground Plumbing Blues. The percussion section drives most of the numbers, but usually keeps to the background – tight, steady drumming seasoned with just a touch of exotic instrumentation (did I hear a wobble board on one of the numbers?). The album starts in chaotic densely contrapuntal mode with the introduction to Icebreaker, but that first number soon settles into a laid-back jazzy style that characterises most of what’s to follow. Some clean unison riffs launch Firewater, a curiously episodic number with some imaginative mute choices in the quieter passages. The slow numbers are Inchcolm and The Healing Stream, both of which allow the players to show off their controlled sustained timbres through some gorgeous harmonies. The style strays close to brass band in the spirituals Wade in the Water and Deep River, but neither ever gets too maudlin. The album doesn’t all work. Two successive numbers about half way through, Enormous Pick Jellyfish and Highforce, are repetitive and too long for their slender material, but things soon pick up afterwards, and overall the album doesn’t outstay its welcome. 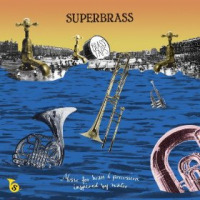 Another impressive offering then from Superbrass, and a worthy successor to their excellent debut disc. One of the acknowledgements in the back of the liner mentions that a Kickstarter appeal helped to launch the project. So congratulations to the online benefactors for their confidence, which has surely been repaid here. And congratulations to Capt. Argente and his crew. Album number 3 eagerly anticipated.